Golden Light Designs art jewellery is a delicate, handcrafted product with stones and crystals that are individually handset. Our jewellery is created from high vibration crystals, semi-precious stones, sterling silver, gold, platinum and also upcycled or natural organic materials. As a handcrafted product our jewellery should be handled with special care. Crystals in particular are delicate and should be treated with great care. You should avoid contact with perfume, lotions, chlorine, sweat and cleaning solutions and avoid soaking your crystal in any kind of jewellery cleaner or water. The best way to clean your crystal jewellery is by using a damp cloth and patting dry with a soft dry cloth. We hand select each and every crystal, stone and material that is used to create our jewellery. You can keep it looking like new by avoiding bumping or scratching it. Jewellery should be removed before sleeping, showering, swimming or playing sport. 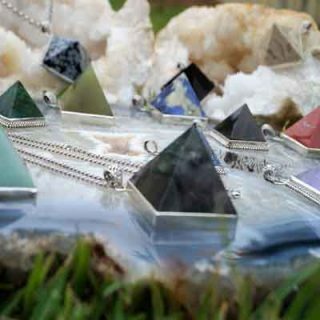 Acknowledging your crystals, talking to them, playing music and having them on display for the world to see will help ensure their high frequency healing energy is maintained and transmitted. Depending on the leather your product is made from, the life and look of it can be greatly affected by the way it is cared for. Leather needs to be moisturised and protected on a regular basis. We recommend you use a good quality Leather Conditioner to moisturise and condition your leather products. When used regularly leather conditioner will help maintain the supple nature of most leathers (it is not recommended for use on suede and some speciality leathers). A good quality Water and Stain Protector will assist in maintaining the beauty of your handbag or leather goods. It is especially good for Suede, smooth leathers and lighter leathers, fabrics and textiles.